The following article was published by Inbuilding Magazine on September 20, 2017. NuLEDs aims to make buildings smarter and seamlessly connected with its PoE lighting systems. Chris and Lisa Isaacson founded NuLEDs in 2011. With their backgrounds in low-voltage LED lighting and control technology, and design engineering, the Isaacsons combined their talents to create a diverse technology company. Today, NuLEDs is a leader in power-over-ethernet (PoE) lighting systems aimed at making buildings smarter and seamlessly connected. The Carlsbad, Calif.-based company is an innovator in LED lighting systems, developing serially interfaced, low voltage controllers, and IT-based LED lighting systems. A big break for NuLEDs came in 2011 when Cisco approached them to develop this technology. In January of 2012, NuLEDs delivered the first PoE lighting system to Cisco that could be both powered and controlled from an ethernet network. Chief Business Development Officer Lisa Isaacson says the lighting and electrical industry has never been the same since, and the company is excited to play a part in it. NuLEDs has customers across the nation and globally, including in London, Scotland and Dubai. Isaacson attributes the company’s growth to multiple partnerships with Cisco and other large electrical and lighting manufacturers including Eaton, USLED, and Deco Lighting. Not only can each LED lamp be controlled and monitored separately, but occupancy sensors can also turn off the lights when no one is in the space. Colored LEDs can also be controlled on the network to create effects. By using red, green and blue LEDs combined at different brightness levels, more than 16 million colors can be created, Isaacson notes. Power management company Eaton today announced a collaboration with NuLEDs™, Inc., aimed at making buildings smarter and seamlessly securely connected. The two companies will go to market with a joint product offering including Eaton’s complete portfolio of PoE-enabled light-emitting diode (LED) luminaires and NuLEDs’ drivers, software, sensors and keypads. The collaboration has already been active in delivering several projects with Eaton’s PoE-enabled Metalux Encounter™ luminaire featuring WaveStream™ LED technology and NuLEDs’ Single Packet Illumination Control Environment solution. The lighting network will include NuLEDs’ NuSPICE™ protocol, allowing for simple communication to its sensors, wall controllers and other devices on the network. Both buildings will include NuLEDs’ PoE modules, the SpiceBox™, which converts PoE power to drive LEDs and sensors. June 2, 2016 By NuLEDs Inc.
Power-over-Ethernet Lighting by NuLEDs at a Miami-Dade school. Kelvin-tunable lights and multiple zones allow for a dynamic classroom. April 19, 2016 By NuLEDs Inc. The following post was originally published at facilitiesnet. Cisco has introduced a new Building Internet of Things solution, the Digital Ceiling, a Power over Ethernet (PoE) network that enables the convergence of building systems including lighting, heating, cooling, sensors, and other actuators. All of these work together to increase efficiency, lower costs, and enable unique user experiences. The net-net: creation of buildings that are not only smart, but also connected, secure, and easy to manage. Digital Ceiling is based on an optimized Cisco IP network that includes enhanced switches that enable lighting and building automation to run on a converged IP network. Features like Perpetual Power over Ethernet (PoE), Fast Boot, Smart Install, and software for sensor integration (including motion, light, temperature, infrared, and humidity) are also included. Digital Ceiling leverages dramatic gains in LED technology. LED costs are dropping 12 percent year over year, said Tony Shakib, vice president of the IoT verticals business unit of Cisco in a virtual roundtable. Meanwhile, LED power efficiency is improving by 20 percent annually, he said. Today, as more building services are moving to IP networks, LEDs can be powered by those same IP networks. The partner community supporting Digital Ceiling currently includes Cree, Philips, Johnson Controls, Eaton, nuLEDs, and nine others. A new Information Exchange provides Digital Ceiling with open and secure communication. This eases interoperability among devices, sensors, and actuators. It enables more efficient communication over CoAP — a standards-based IoT protocol. 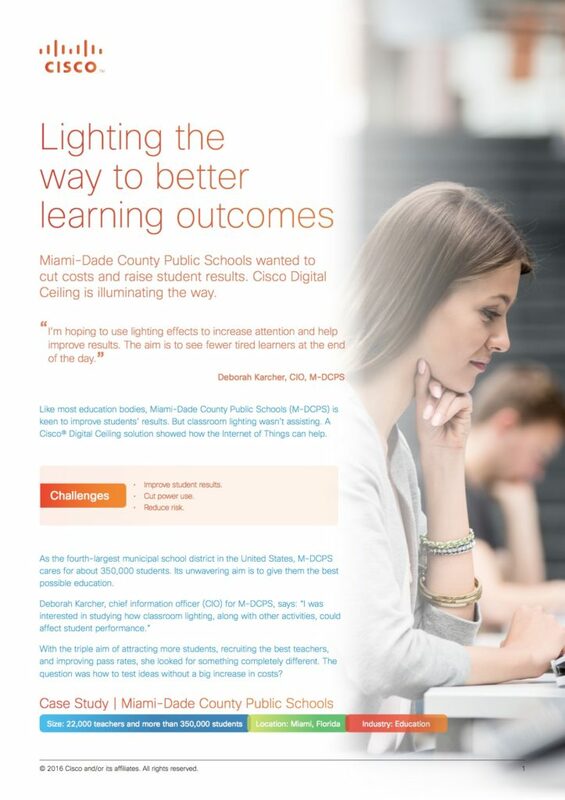 Mobile County (Alabama) Public Schools plan to use Digital Ceilings to enhance student achievement and improve security by providing lighting for early warning and fire detection, while reducing operating costs. Digital Ceiling is one of three new solutions in Cisco’s Digital Solutions portfolio. The other two are Customer Experience (which aims to deliver a better experience, as well as to measure and optimize on each customer interaction) and Workforce Experience (using face-to-face collaboration and conferencing, this offer is made up of standardized room types that allow you to set to your preference and then roll out). The new digital solutions are based on validated designs and use cases. Orderable as one solution, they bring together hardware, software, and services. January 3, 2016 By NuLEDs Inc.